This may sound funny - but it works!! The data LED of your wireless router is constantly blinking and none of the family members are using the Internet at home. This might indicate that someone outside – probably one of your neighbors – is enjoying the web using your Wireless network. 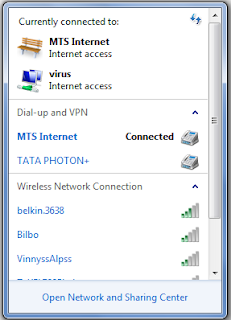 One has a brilliant idea to discourage such people from connecting to your wireless network – rename your network name (SSID) to something scary – like c:\virus.exe – and the non-techies are very unlikely to use your Wi-Fi network ever. To change the SSID of your wireless router, log in to your router’s admin console and rename the network under Basic Wireless setting as shown in this screenshot.